How do you help make a difference and give a gift for $2? 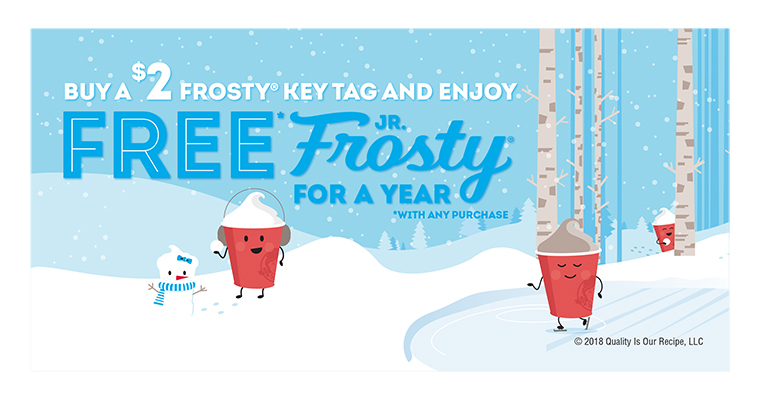 Enter the Frosty® Key Tag: little tags with big rewards, perfect for gifting this holiday season. Wendy’s® Frosty® Key Tags may seem like a cool treat, but they’re so much more than a quick pick-me-up. Much like our Halloween-themed Boo! Books™, Frosty Key Tags are an essential part of our brand fundraising efforts for our charity of choice, the Dave Thomas Foundation for Adoption®. We started selling Frosty Key Tags in 2010, but these special tags are just one way we support foster care adoption. And while Frosty Key Tag sales raised more than $6 million for the DTFA last year, we’re looking to up the ante and raise $10 million in 2018. You might be asking, “What exactly is a Frosty Key Tag?”. Frosty Key Tags are little tags with BIG rewards. For just $2, Wendy’s fans can enjoy a FREE Jr. Frosty with any purchase for an entire year*. So, whether you’re picking up a $1 any size fry or a meal for the entire family, you can treat yourself to a free Frosty. Plus, proceeds from each Frosty Key Tag purchase will be donated to help find adoptive families for children in foster care. As if that isn’t cool enough, you can even purchase Frosty Key Tags in bulk at participating Wendy’s restaurants. That said, we know the holidays can be hectic, so we’ve made it easy to purchase Frosty Key Tags in bulk through the DTFA’s website. Check out some ways you can gift a Wendy’s Frosty Key Tag to friends and family this holiday season and help Wendy’s raise $10 million to help find forever families for children in foster care. Struggling to find a gift for that person in your life who has everything? The Frosty Key Tag is a great standalone gift or a little extra something special to add in. You never know how a small gesture of kindness may impact someone’s day – surprise and delight a stranger with a Frosty Key Tag! After all, paying it forward can go a long way. If you’d like to give back to your community but just don’t know how, look no further than a bulk order of Frosty Key Tags. They make the perfect gift for those in the community who may need a little brightness during this time of year. Spruce up the typical holiday card and slip in a Frosty Key Tag for the gift that keeps on giving throughout the year! Treat the special people who have had your back all year with Frosty Key Tags. Instead of bringing a coffee mug to the holiday party, give your co-workers something they will actually use! Sign up to get The Square Deal delivered right to your inbox. The list will not be shared publicly. Ever.